John K. Anderson of Kennebunk, ME died January 25, 2019 peacefully at his home with his loving wife Collette by his side. John was born on December 4, 1924 in Somerville, MA. He was the eldest of four children born to Jacob and Margaret (McDermott) Anderson. He lived his young life mainly on 129 Shore Drive in the Ten Hills neighborhood of Somerville and attended the local schools. John was a veteran of World War II and served in the US Army in the Philippines and Japan. Following his discharge from the service he worked in the Boston area as a roofer for the Boston Navy Yard and Belmont Spring Water. Later he was employed by Polaroid Corporation as a truck driver for 26 years and retired in 1985. He then worked as a senior driver for ADP (Automatic Data Processing) for 15 years and retired in 2001. John was a past member of the Chelmsford Lodge of Elks and a current member of the Polaroid Retirees Association. He was a communicant of St. Martha’s Catholic Church in Kennebunk, ME. 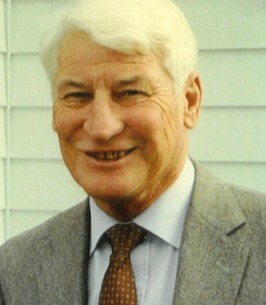 From the time he was a young boy he was an avid Boston sports fan and loved to read, play cribbage and swim – especially in the refreshing waters of York Beach, ME. John formerly resided in Lowell, MA and Arlington, MA before moving to Kennebunk in February 2002. John was predeceased by his parents; his beloved grandfather and role model, Vincent McDermott; his sister, Bernadette Maguire (2015) and his brothers, William Anderson (1992) and Donald Anderson (2013). He is survived by his wife of 38 years, Collette (LeBlanc) Anderson; his daughters, Donna A. Cook and her husband, Jack, of Chandler, AZ and Joni R. Fahey of Lewisville, TX and his son, Kenneth J. Anderson and his wife, Barbara, of Shoreline, WA. He also leaves four grandchildren and one great grandchild as well as many beloved nieces, nephews, grandnieces and grandnephews. John’s family appreciates the tender care shown to him by his physician, Dr. Robert Carpenter, Hospice of Southern Maine and the Kennebunk EMT’s. Friends may visit from 2-5 pm on Wednesday, January 30, 2019 at Bibber Memorial Chapel, 67 Summer Street, Kennebunk, ME. A funeral mass will follow at 11 am on Thursday, January 31, 2019 at Holy Spirit Parish – St. Martha’s Church, 30 Portland Road, Kennebunk, ME. Interment will be held later in St. Thomas Cemetery, Palmer, MA, date not yet determined. Should friends desire, donations in John’s memory may be made to the Jimmy Fund, to support cancer research and patient care at Dana-Farber Cancer Institute, PO Box 849168, Boston, MA 02284 or via www.jimmyfund.org/gift. Interment at St. Thomas Cemetery in Palmer, MA will be held at a later date. Once determined, date and time will be updated here.